Watermelon is one of the most delicious and nutrients rich fruit of summer season. Outer surface, the fruit has smooth, deep green or yellow color thick exterior rind with light-green or gray colored vertical stripes all over its outer surface. Inner side of the fruit has a juicy, pink, red, or yellow pulp with numerous small black seeds embedded in the middle third of the flesh. Watermelon is an excellent source of Vitamin A which is essential for good vision and maintain healthy mucus membrane.Watermelon prevent from macular degeneration and prevent from age related vision problems. The lycopene in watermelon is especially important for our cardiovascular health. Consuming large amounts of watermelon has also been correlated with improved cardiovascular function because it improves blood flow via vasodilation (relaxation of blood pressure). Therefore, the watermelon is very helpful in preventing strokes and heart attacks.Watermelon is a good source of potassium; Potassium is an important component of cell and body fluids that helps controlling heart rate and blood pressure; It thus offers protection against stroke and coronary heart diseases. Watermelon contains no fat. It is a good source of Vitamin-C, beta carotene and lycopene, all these compounds help in preventing heart related problems. They help in lowering the bad cholesterol (LDL) and prevent cholesterol accumulation in the blood vessels. Watermelon is rich in anti-oxidant flavonoids like lycopene, beta-carotene, lutein, zeaxanthin and cryptoxanthin. These antioxidants are found to offer protection against colon, prostate, breast, endometrial, lung, and pancreatic cancers. Phyto-chemicals present in watermelon like lycopene and carotenoids have the ability to help protect cells and other structures in the body from oxygen-free radicals. Watermelon is a rich source of potassium which is helpful in detoxifying all the toxins from the kidney. It flushes out uric acid and reduces the formation of renal calculi in the kidney thus making it efficient. Moreover high water content in watermelon helps in the proper functioning of kidneys. Watermelon is a natural diuretic which helps increase the flow of urine, but does not strain the kidneys. Watermelons helps the liver process ammonia (waste from protein digestion) which eases strain on the kidneys while getting rid of excess fluids. A watermelon is rich in calcium which aids in the preservation and strengthening of bone structures and helps prevent bone loss. Watermelon contain a good amount of lycopene that reduces oxidative stress which normally reduces the activity of osteoblasts and osteoclasts(Bone forming cells).This means consuming lycopene-rich foods like watermelon stronger your bones. Watermelon is also rich in potassium which helps to retain calcium in your body, resulting in stronger bones and joints. Watermelon contains Vitamin B6, B1, C, manganese and many other powerful-anti oxidants that not only boost natural immune system but also provide a kind of protection shield against outer infections. Watermelon is a good source of Arginine which help a lot to treat erectile dysfunction in men. Recent scientific experiments show, watermelon can increase sperm number and motility also improve the structure of sperm and improve male fertility. Watermelons are low in calories and contain very less amount of fats but rich in water contents and essential nutrients and thus reduce your eating demand and hence help a lot to reduce weight. Citrulline in watermelon has been shown to reduce the accumulation of fat in our fat cells. Thus helps prevent over-accumulation of body fat. Watermelon is really helpful for students for increasing their brain power as it contains good amount of Vitamin B6 that is helpful in increasing brain power. 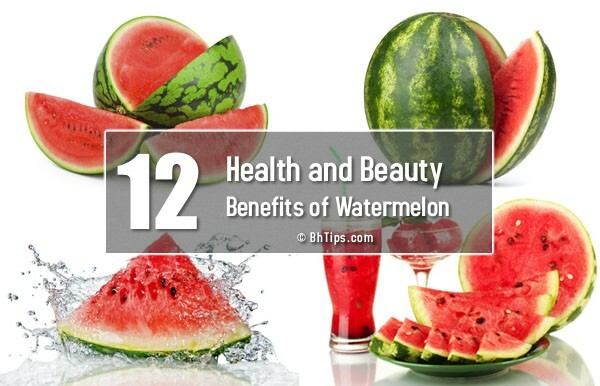 Watermelon is a good source of lycopene, Vitamin C and Vitamin A. All of these nutrients help a lot to fight against skin damaging free radicals that can cause fine lines, wrinkles and dark spots on the skin. The content of antioxidants in watermelon also reduces deposits of free radicals in the body and prevent all signs of skin aging.